This is the paper I submitted to the Central Banking and Green Finance workshop organized by the Council on Economic Policies (CEP) and De Nederlandsche Bank. I wrote it to stimulate a discussion about how central banks can contribute to the fight against climate change. The text does not necessarily reflect my personal opinion. The EU climate target and the ECB mandate: separate worlds? Although the transition to a low carbon future will profoundly change the European economy, the mandate of the ECB does not contain any climate related objectives. Monetary policy is conducted without consideration of the EU’s energy strategy. This paper argues that the ECB should align its monetary policy with the EU’s climate goals. By funding green infrastructure, the ECB would directly boost employment and economic growth. The proposed solution avoids the ‘one size fits all’ problem faced by a central bank that sets a single official interest rate for a currency union with diverging national economies. On top of that, the proposal is rules-based, has a clear transmission mechanism, and does not involve buying sovereign debt. All of these elements are improvements over QE. The EU should create a new entity to build renewable energy infrastructure. Let’s call this entity the European Green Infrastructure Company (EGIC). The EGIC would have national branches that prepare “shovel ready” projects such as the installation of rooftop solar panels, building wind farms, networks of charging stations for electric vehicles, etc. Figure 1: Balance sheets of the European Green Infrastructure Company (EGIC) and the ECB. The ECB creates ‘cash’ (base money) to buy a bond of the EGIC. The EGIC spends the money on workers and suppliers. After the construction project is finished, the EGIC’s assets consist of new infrastructure (Figure 2). Figure 2: Balance sheets of the EGIC and ECB after completion of a project. The EGIC has turned its cash into new, green infrastructure. There are a number of reasons why the ECB, rather than commercial banks and private investors, should buy the bonds of the EGIC. First, the ECB has infinitely deep pockets. The amount of infrastructure investment by the EGIC is not limited by available savings. Second, the ECB does not need to make a profit. In principle, the bonds could offer a 0% interest rate. Public money is used to fund public infrastructure without simultaneously enriching wealthy private investors. Third, issuance and repayment of the bonds should depend on macroeconomic conditions, as explained in the next paragraphs. What is the link between monetary policy and the scenario outlined above? Well, the ECB should not mechanically fund any project proposed by the EGIC. The ECB should make its funding conditional on macroeconomic parameters. The central bank could specify that it will only buy bonds of the EGIC in a certain country if (wage) inflation is low and unemployment is higher than a certain threshold in that country. For example, suppose the ECB would buy EGIC bonds if wages don’t grow more than 3% per year and unemployment is above 6%. Under those rules, the ECB could have funded infrastructure projects in Germany between 2000 and 2010. As shown in Figure 3, German wage growth lagged the rest of Europe in that time period. Figure 4 shows that German unemployment has been under 6% since 2011. Consequently, no new EGIC projects would have been started in Germany after 2010. Figure 3: Wage growth in selected euro area countries. Source: Bruegel. Prior to 2008, robust wage growth in Spain (Figure 3) would have prevented the ECB from funding green infrastructure in that country despite an unemployment rate above 6%. 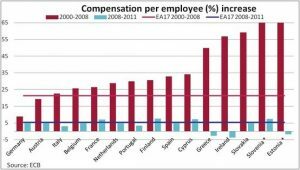 But Spanish unemployment figures rose sharply after 2008 (Figure 4), while wages stagnated.8 Thus the Spanish EGIC branch would have qualified for ECB funding as the crisis hit. 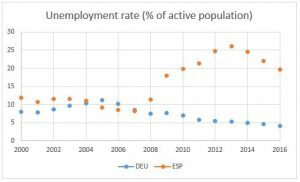 Figure 4: Unemployment rate in Germany (DEU) and Spain (ESP) between 2000 and 2016. Figure created with data from Eurostat. The proposal has inflationary and deflationary aspects. By competing for workers and resources, investments by the EGIC are inflationary. At the same time, an abundance of renewable energy will keep energy prices down. As long as the ECB is meeting its inflation target, the EGIC could reinvest its profits. If inflation is too high, the ECB could reduce aggregate demand by no longer buying new EGIC bonds. In a second step, the central bank could demand a (gradual) repayment of the EGIC bonds in its portfolio. This would drain money from the economy, which should cool inflation. As illustrated with the examples of Germany and Spain in the previous section, the proposal of ECB funded green infrastructure bonds is inherently countercyclical. Economies with high unemployment get a boost. The investments in renewable energy will make the receiving countries more competitive. They can attract companies with modern infrastructure and cheap energy. A lower demand for imported fossil fuels will improve their trade deficit. Because workers on EGIC projects have a higher income than if they would be unemployed, the investments also lead to a multiplier effect. In return for helping the EU as a whole to reduce its carbon emissions, the resources of the EGIC would be deployed in locations that suffer from an economic dip. No region should envy the EGIC investments, as everybody benefits from them. Unemployed workers would get productive jobs. Competitiveness of lagging countries would be spurred by investments, rather than the grinding internal devaluation through high unemployment. The transition to a low carbon economy is a global challenge. Adding climate targets to the mandate of the European Central Bank could be a template for the rest of the world. Under their quantitative easing programs, central banks have created trillions of euros and dollars of new reserves to buy financial securities. This has boosted the prices of assets that are mainly owned by the wealthiest households.10 Yet QE has done little for growth and employment in the real economy. By directly funding infrastructure investment, the money created by the ECB has an immediate effect on gross domestic product. Some might say that the purchase of EGIC bonds by the ECB would violate the prohibition on monetary financing. The (never implemented) Outright Monetary Transactions (OMT) program of the ECB was attacked with this argument. The ECB argued that the OMT was a necessary and proportional monetary policy measure for maintaining its price stability objective.11 The German high court ruled that the OMT program was legal.12 The same arguments could be used to defend the green infrastructure program. Furthermore, the scheme described in this paper entirely avoids the financing of government debt by the ECB. Unlike under existing QE programs, the central bank would not interfere with the price of sovereign debt. Won’t EGIC projects lead to waste? Public projects always have the risk of turning into boondoggles. That is why a European organization needs to be set up, with professional managers and auditors. The international controls should prevent cost overruns, shoddy implementation and outright corruption. The economics of this proposal is rather straightforward. There’s also historical proof of the concept. In the 1930s, Hjalmar Schacht financed Germany’s rearmament with Mefo bills.13 The German central bank bought promissory notes (similar to the bonds in this proposal) from the Mefo company, which would use the cash to purchase weapons. The policy stimulated employment and economic growth without causing inflation. Luckily, the present proposal is intended to fight climate change, not to fight a war. Can this proposal be modified or combined with other ideas? Sure. This is discussion paper. I welcome all feedback! This paper proposes to create a European Green Investment Company (EGIC). The EGIC prepares shovel ready infrastructure projects. Based on macroeconomic circumstances, the ECB funds these infrastructure projects by purchasing EGIC bonds. This way, the European Central Bank gets a countercyclical tool with greater control over price stability, while supporting the fight against climate change. Bankers are people, too explains the mechanisms of banking, including central banking. I deliberately don’t advocate new policies in my book. European Commission, „2030 Energy Strategy,” https://ec.europa.eu/energy/en/topics/energy-strategy-and-energy-union/2030-energy-strategy. European Commission, „Supporting climate action through the EU budget,” https://ec.europa.eu/clima/policies/budget_en. European Central Bank, „Objective of monetary policy,” https://www.ecb.europa.eu/mopo/intro/objective/html/index.en.html. European Central Bank, „Asset purchase programmes,” https://www.ecb.europa.eu/mopo/implement/omt/html/index.en.html. European Central Bank, „Inflation dashboard,” https://www.ecb.europa.eu/stats/macroeconomic_and_sectoral/hicp/html/inflation.en.html. T. Fairless, „ECB Unemployment Figures Support Case for Ongoing Eurozone Stimulus,” Wall Street Journal, https://www.wsj.com/articles/15-of-eurozone-workers-are-unemployed-or-underemployed-says-ecb-1494405325. In reality, the ECB would not create literal cash. The EGIC would receive money on an account of a commercial bank. The commercial bank gets new reserves. A more thorough discussion of central bank accounting, including the role of commercial banks, can be found here and here. „Spain Average Nominal Monthly Wage,” https://tradingeconomics.com/spain/wages. „One size fits none,” The Economist, http://www.economist.com/node/13767363. J. Hartley, „How Federal Reserve Quantitative Easing Expanded Wealth Inequality,” Forbes, 2015. https://www.forbes.com/sites/jonhartley/2015/06/25/how-federal-reserve-quantitative-easing-expanded-wealth-inequality/#53b7eeb821eb. European Central Bank, „COMPLIANCE OF OUTRIGHT MONETARY TRANSACTIONS WITH THE PROHIBITION ON MONETARY FINANCING,” https://www.ecb.europa.eu/pub/pdf/other/mb201210_focus01.en.pdf. „German high court rules ECB’s OMT program legal,” DW, 2016. http://www.dw.com/en/german-high-court-rules-ecbs-omt-program-legal/a-19344603.